2. Include the JSon file with the settings of your markup set. The default one in this example. 3. Include the CSS files. Differents insertion mode can be used by pressing key. Opera doesn’t fire event on Ctrl, Shift, Alt keys. Ctrl + Click on a button: Call a markup insertion and get the selection back. Shift + Click on a button: Call a markup insertion and get the selection with new added markups. Ctrl Key + “Key” triggers the button with accessKey defined. Ctrl + Shift + Click on a button: Call a markup insertion on every lines of the selection instead of the whole selection. Alt Key + Click on a button: Call an alternative markup insertion if defined (See MagicMarkups). Every button has a .markItUpButtonX, .markItUpButtonX-X, ... (X is the position in the toolbar). Apply a specific className to the wrapping Div. Useful to prevent CSS conflicts between instances. Enable/Disable the handle to resize the editor. Display the preview in a popup window with comma-separated list of specs. If empty or false, the preview will be displayed in the built-in iFrame preview. AutoRefresh the preview iFrame or windown swhen the editor is used. You can set the path of your own parser to preview markup languages other than html. If this property is set, the built-in preview will be overridden by your own preview script. Use ~/ for markItUp! root. Name of the var posted with the editor content to the parser defined above. 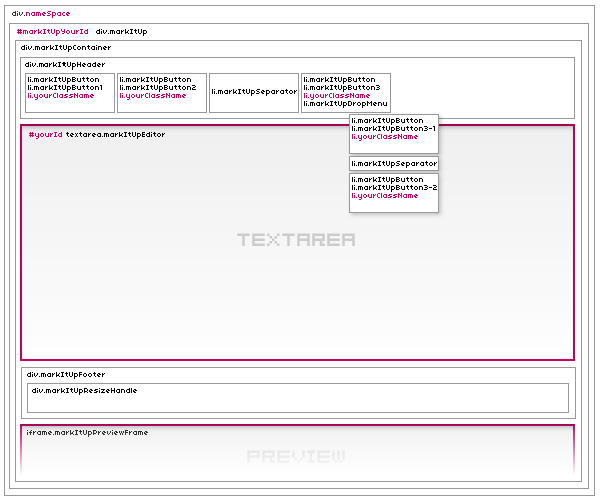 Path to the Html preview template. Position of the Built-in preview before or after the main textarea. Define what to do when Enter key is pressed. Keep (true) or not (false) the default behaviour of the key. Define what to do when Ctrl+Enter keys are pressed. Define what to do when Shift+Enter keys are pressed. Define what to do when Tab key is pressed. Warning, this key is also used to jump at the end of a new inserted markup. Keep or overide the default behaviour of the key. Function to be called before any markup insertion. See Callbacks section for more details. Function to be called after any markup insertion. See Callbacks section for more details. Classname to be applied to this very button. Shortcut key to be applied to the button. Ctrl+key trigger the action of a button. Markup to be added before selection. Accepts functions. See Callbacks section for more details. Markup to be added after selection. Accepts functions. See Callbacks section for more details. Text to be added in place of the cursor or selection. Accepts functions. See Callbacks section for more details. Text to be added before a whole block. Accepts functions. See Callbacks section for more details. Text to be added after a whole block. Accepts functions. See Callbacks section for more details. Set whether the tags has to be inserted at each line or on the whole selected block. Placeholder text to be inserted if no text is selected by the user. Function to be called just before a markup insertion. If a global beforeInsert callback is already defined this function is fired just after. See Callbacks section for more details. Function to be called just after a markup insertion. If a global afterInsert callback is already defined this function is fired before. See Callbacks section for more details. Function to be called before a multiline markup insertion. See Callbacks section for more details. Function to be called after a multiline markup insertion. See Callbacks section for more details. Open a dropdown menu with another button set defined as above. Some of the properties above accept special markups like [![a]! ], [![a:!:b]!] to display a prompt window and (!(a)! ), (!(a|!|b)!) to call an alternative insertion when Alt Key is hold (when supported by the browser). Ex. Insert <p> or <p style="text-align:justify"> if Alt key is hold. Ex. Insert <td> and </td> or <th> and </th> if Alt key is hold. Ex. Insert <p> or ask Class before insering <p class="..."> if Alt key is hold. When a callback function is called, the parameters below are passed. Returns the position of the selection. If a multi-line edition is trigged (Ctrl + Shift + click). This property return the number of the line being processed. Returns true if the Control key is pressed when the callback is fired. Returns true if the Shift key is pressed when the callback is fired. Returns true if the Alt key is pressed when the callback is fired. You can use the markItUp! features from anywhere in the page. You can use any properties as in the markupset section, (except *). If you have several instances and no target is defined, the job will be done in the focused editor. Ex. Wrap selection with <strong></strong> in the focused markItUp! editor. Ex. Wrap selection with [b][/b] in the markItUp! editor with #bbcode id. Just edit the preview.html file in markitup/templates/preview.html. Note that the content will replace the <!-- content --> comment. In order to link external files as Css files or scripts, use ~/ to refer to the markItUp! root. You can use different template for different instances.